The N4960A is an affordable and compact Serial BERT available in 4-17 Gb/s and 5-32 Gb/s configurations. It is the perfect solution to test multiple channels from 25 to 32 Gb/s for 100 Gigabit Ethernet applications and other multi-channel high-data rate devices operating either synchronously or asynchronously. 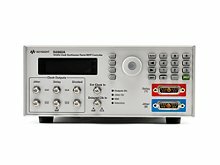 The N4960A Serial BERT consists of an N4960A clock/controller with N4951A or N4951B pattern generator and N4952A error detector remote-mountable heads. The pattern generator and error detector support PRBS or user patterns and operate up to 32 Gb/s in a single band with no gaps or missing data rates. The remote heads allow the test equipment to be located very close to the device under test, eliminating the need for long cables that degrade signal quality.